So, I was busy routing a board having come up with a basic schematic. I wasn’t going to order the board yet, I wanted to just play around with the design, see how compact I could make this. One thing that was niggling in the back of my mind, was how the traces would cope with the current. 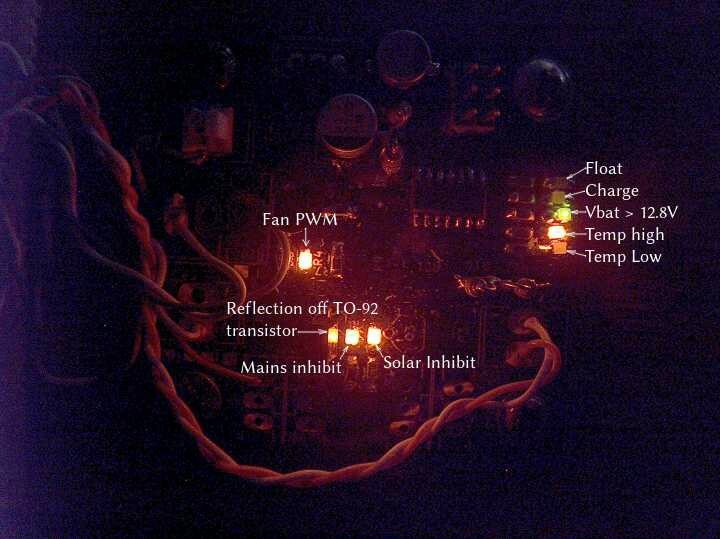 I use 6AWG cable from the solar panels, and 8AWG from the batteries. How wide should I make the traces? One calculator reckoned I should make them about 7cm wide! Another option was to use heavier gauge traces, maybe 3oz copper. A 5cm×5cm 2-layer board would cost a staggering AU$263 for just the PCB! Okay, so I can work around this by fiddling the solder mask in Kicad and just solder some copper wire along the trace. Not a show stopper. I’ll just make wide traces so I know where to lay the wire and have plenty of area to solder it. The “-” option, better known as “we couldn’t be stuffed looking up what the real value is”, is seen as “greater than everything else”. A check of the datasheet itself, revealed the truth. In short, there is no way that little tiddler is going to manage the current I was contemplating throwing at it! What’s the biggest I can get that will handle that current? Well if I take the “-” option out of the equation, they suggest this monster . It’s 10uH instead of 33, so my ripple voltage will increase. At $837.84, it is also a rare exception to the free shipping over $60 offer. I might need to go play with some numbers to see what I can get away with. The good news is that discontinuous output is not a show stopper for a battery charger. I might have to make do with nanohenries of inductance instead of microhenries. So, a thing that will make or break this project, will be the connectors that feed power in and out. My existing system uses the larger 50A Anderson connectors. These are big and chunky, not really appropriate for a PCB. The 30A version would be okay size-wise, and I use these on the bike, but 30A isn’t sufficient. That’s about my cluster’s peak current draw, and I want a 50% safety margin. Thinking about it last night… 20V at 50A… that’s a kilowatt! Pales into insignificance when you compare it to the 48V 400A electric harvester I worked on years ago (and blew many a MOSFET on, not to mention boiling electrolytics with ripple current), but it’s still a decent amount of power. There’s the XT60 and Deans connectors, however the problem with these is they aren’t all made equal, there’s some slight variances in the tolerances, thus you can buy two “XT60″s or two “Deans” connectors and find they won’t mate. I see no problem in a short flying lead that connects to screw terminals. Take the flying lead, wire it up, then connect it to the connector of your choice. That’s how the solar controller I was using connected up, and I don’t think its problems were with its connectors. The conductors I’m using are 6-8AWG. Whatever I use, must be able to handle that. There isn’t a lot out there for off-board connectors, and even the XT60s are a wee bit small. I did find these terminal blocks . Supposedly good for 76A, that’s enough safety margin for me, and Phoenix Contact aren’t known for producing crap. The spade lugs used on the HEP-600C I’m using for charging my batteries would be smaller than this, and so far I’ve not seen any fires. I might be able to put a few different footprints down on the PCB, we’ll see. I plan to design the PCB so there’s nice wide areas so you can drill your own hole and solder whatever you like there. Likewise for the inductor and capacitors, this will be a board that aims for flexibility. 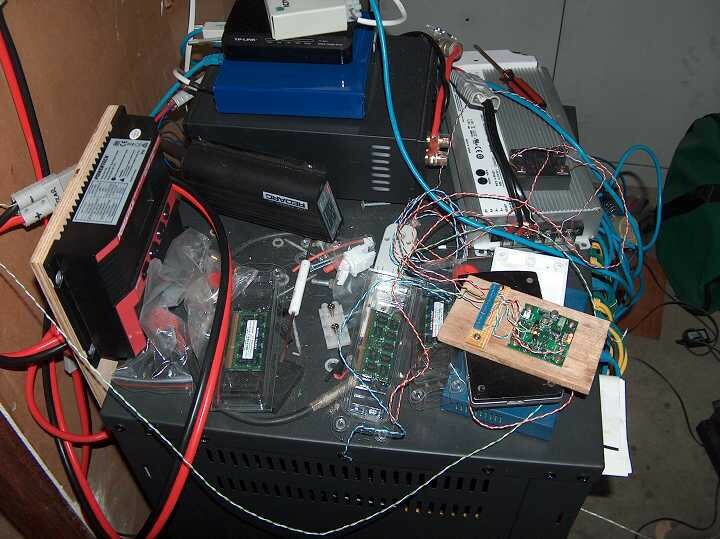 So, I’ve been pondering doing a more capable power controller for the purpose of enhancing or even outright replacing the solar controllers I have now on the Solar-powered cloud computing cluster. The idea started as a straight DC power meter with a Modbus interface, as there’s pretty much nothing on the market. Lots of proprietary jobbies, or display-only toys, but nothing that will talk an open protocol. I started designing a circuit. I thought: it’d be handy to have digital inputs and outputs. Lots of mains energy meters have them, and they’re handy for switching loads. My remote reset facility when porting the mainline kernel to the TS-7670 was a digital output on the CET PMC-519. If I crashed the TS-7670, I basically fired up ipython, loaded pymodbus, connected to a Modbus/TCP gateway, then issued a few write-coil commands to power-cycle the TS-7670. Often the digital inputs are hooked to water or gas pulse meters to meter usage: you get a pulse every N litres of water or every N cubic metres of gas. A meter with digital I/O that’s programmable would be just perfect for the job my little power controller is doing. I could make the channels PWMable, thus be able to step down the voltage. Put an INA219 on there, and I’d have current measurement and power control. The idea evolved to putting the INA219 and a MOSFET on a board, so it was a separate module: just to make board layout easier and to reduce the size of the boards. For a buck converter, you just add an inductor and a few smoothing capacitors. Better yet, two INA219s and a MCU would let me measure power in, out, and have localised brains. Thus the idea of a separate, smart module, was born. For kicks, I’m also adding the ability to boost as well by tacking a boost converter to the end. Again, that diode can be replaced with another MOSFET. This will step up a voltage, but not down. SEPIC is basically a boost plus a buck-boost. Efficiency is not their strong suite apparently, although there are ways to improve it. I’m not sure the added complexity of two boost converters sandwiching a buck converter is worth it. Ćuk is no good here because it inverts its output, unless you want an isolated one, which is going to be $$$$ because of the transformer needed. Yes, I’m chickening out! Split-Pi looks real interesting, in that it’s bi-directional. In the event I ever decide to buy a front-wheel motor for my bicycle, I could use one of these to do regenerative braking and save some wear on my brake pads. I haven’t seen many schematics for this though, just generalised ones like the one above. Zeta also looks interesting, but it’s pretty unknown, and has a higher parts requirement. It could be worth looking at. It’s a close relative of the SEPIC and Ćuk. So I’m thinking we design for a buck converter, then the boost just comes along for the ride. There’s a handy primer here for designing a buck converter. For a 20V input and 14.6V output, their formulas suggest a 33µH inductor should cut the mustard. One of these which can handle >50A is not a big or expensive component. In the above system, we need to be able to drive up two pairs of complementary outputs at high speed. We can forget the hacker darling ATTiny85, as with 5 pins, it barely has enough to do the SPI interface, let alone talk I²C and drive four MOSFETs. A good candidate though is the chip I used for the #Toy Synthesizer — the ATTiny861 . This chip has the same high-speed PWM, and I already know how to drive it. It doesn’t have a lot of brains, but I think it’ll do. The challenge will be in-circuit programming. 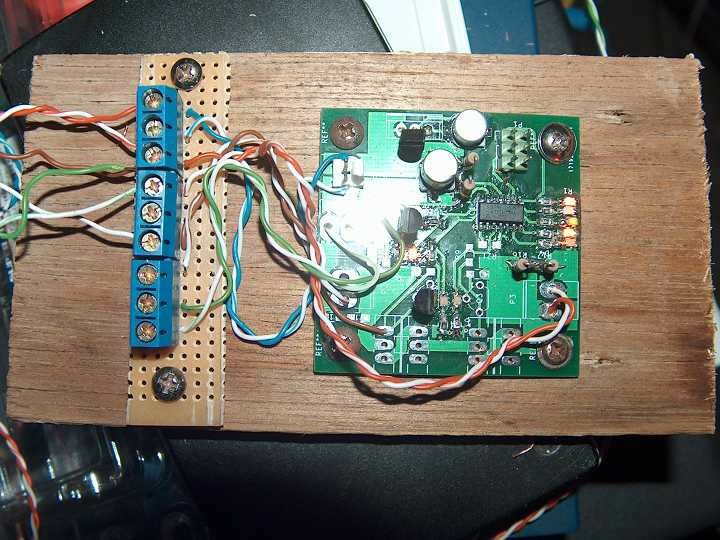 There are just 3 PWM outputs that don’t clash with ICSP. Don’t be fooled by the presence of two DI/DO/USCK pins, it’s the one UCI interface, just you can switch which pins it uses. That’ll be handy for talking I²C, so I’ve earmarked those pins in purple. The nRESET pin is marked in green, the PWM pins in blue. When nRESET is pulled low, PB switch to the functions marked in red. This doesn’t matter for the toy synthesizer as I only need two PWM channels, and so I chose OC1B and OC1D. Here, I need nOCID (no problem) and nOC1B (uhh oh). During run-time, I could put my SPI interface on PA and bit-bang the I²C, but I don’t want MOSFETs chattering when flashing new firmware. Thus, when in reset, I need to inhibit nOC1B somehow. When stepping up: SW1 will be held on , SW2 will be held off , and the PWM will drive SW3/SW4. When stepping down: SW3 will be held off , SW4 will be held on , and the PWM will drive SW1/SW2. We’re only PWMing two MOSFETs at a time, so could get away with just one complementary pair, OC1D/nOC1D. We ignore OC1B and can now use it for something else. We just need a means of “selecting” which pair of MOSFETs we’re driving. A PWM output with 8-bits resolution and 250kHz cycle frequency has a minimum pulse width of about 15ns (1/64MHz). A SN74AHC244 tri-state buffer will do nicely. We can use two GPIOs to control the two enable pins to switch the OC1D/nOC1D and a pair of other pins for manual control. Perhaps PA to select where the PWM signals get routed, and PA to control the non-PWMed MOSFETs. Due to switching speed requirements, we will need to run the ATTiny861 at 5V. So maybe make some room for some level shifting of the SPI interface to support 3V master interfaces as this is much lower speed than the PWM output. This leaves PB3, PB6, PA1 and PA3 free for GPIOs to use however we wish. Two of these should probably be made part of the host interface, one for chip select (PB3 seems a good choice) and one for an interrupt (maybe PB6). Add the 5V/0V power rails, and nRESET, and the same interface can be used for ICSP too. The idea looks doable. The challenge will be making the control algorithm work within the constraints of the ATTiny861, but given what people have done with the ’85 which has the same core, I’m sure it can be done. Well, I finally got around to installing that power controller. You can see above I’ve just tacked wires onto the points I need and brought those out to a terminal strip. There’s provision there for some PWM-controlled fans, but right now this is unused. I’ve omitted the parts not required for the application. If this works out, I might consider doing another board, this time better dedicated to the task at hand. With that controller in place, I’ve now wound the charger back up. In fact I made a whoopsie at first: I forgot that the Vout pot on the HEF-600C-12 sets the float voltage and wound that right up to 14.4V which meant a boost voltage of 15V! Thankfully I looked over at the volt meter on the solar controller and realised my mistake quick. 15 seconds won’t hurt anything, but it is now set at 13.6V. You don’t even see it on the 40-sample average. The controller should let the mains charger sit there for an hour before it reconsiders the need for mains. I think my next step … there’s a yard that could do with a hair cut… I’ll drag the mower out and chase that around the yard for a bit. Then we’ll see what it looks like. Okay, back from a little mowing… and sure enough, the controller is mostly doing the right thing. I think I’ll need to tweak some set-points, maybe set the solar threshold lower. Thankfully the “inhibit” LED is just an indication that it considers the solar voltage low, the solar is going to be on no matter what. Yes, that SSR is massive for the job. It’s what I had on hand at the time. I’ll probably replace it with something small, maybe a reed relay since they’re cheap. 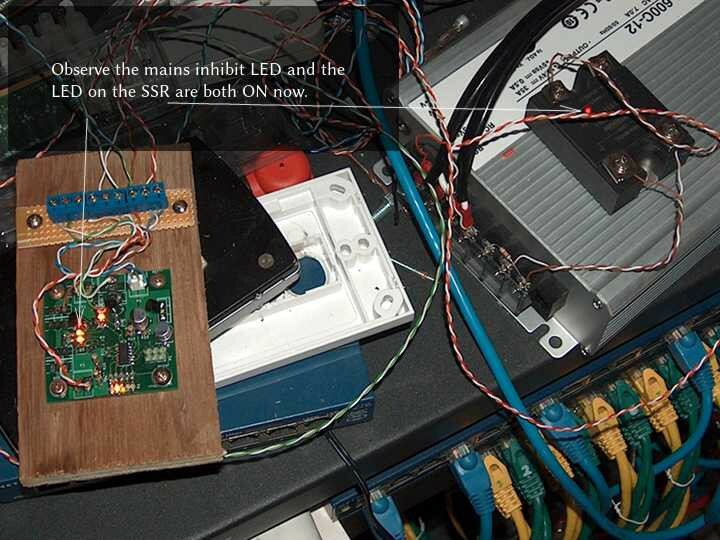 Right at this point, I have the SSR’s inputs connected between the solar V+ and the BC-547B on the board, so when the sun *does* go down, the mains power will be turned back on no matter what the controller thinks. We’ll ignore the temperature ones. Ultimately they indicate the state of the fan controller, and in this state, it’d be running the fans, as indicated by the Fan PWM LED to the left. Temperature is measured by the sensor in the ATTiny24A on-board, so not highly accurate. The other mystery “LED” is the shiny surface on the BC-547B to the left of the two source status LEDs. Here, I suspect the sun ducked behind a cloud so the voltage dropped, hence both “inhibit” LEDs came on. Earlier, “Float” was lit (you can sort-of make it out in the previous photo), the charger was actually actively trying to charge the battery, but to the controller it looked to be done. It left it go for the hour as programmed, then turned off the mains charger to let the solar panel take over. The idea is that during the day, if it gets low, give it a boost from mains, then go back to solar. We only want to rely on mains at night. Now, it should stay in that state until tonight, when the lack of sun should bring the mains charger online (by sheer fact that the solar panels power the “coil” of the relay). So, I saw that, and had a look… sure enough, the controller is still asserting that the mains charger should be off. I think I need to bump the battery thresholds up a bit, although that’s still safely above the danger zone, it’s lower than I’m comfortable with. Right up until 5:58PM, it seems the MCU just held on, thinking the battery voltage was “good enough”, so no need for a charge yet. I might want to drop the solar threshold down some so it doesn’t “flap” when broken cloud passes over, then raise the minimum battery threshold a bit. Even now, the thing that’s turning the mains charger on is the fact that the 1.5V coming off the panels is not sufficient for activating the solid-state relay I’m using. I’m thankful I wired the SSR to Vsolar and made the MCU output open-collector. This is a useful little safety feature, making it impossible for the MCU to latch-up and hold the mains charger off, as the sun will eventually set, and that will force the mains charger to turn on like it did tonight.